Perfect Jeera Rice (Indian Cumin Rice) - Ready in 10 minutes! 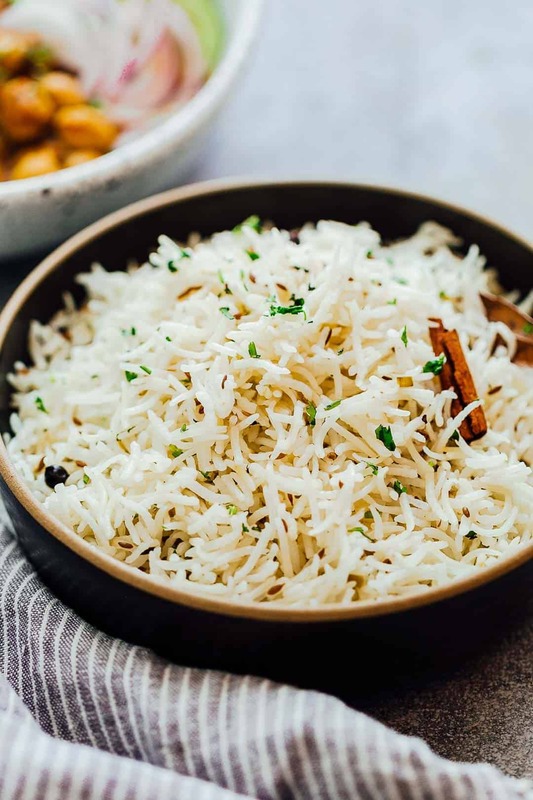 This recipe makes the perfect jeera rice and is the only one you’ll need when you want fluffy, perfectly cooked rice which is full of flavour, but super simple to make. You won’t believe it but this takes under 10 minutes to cook! Do you see how every grain of rice is separate? It’s not overly greasy or undercooked or gluggy. We are talking about the perfect jeera rice, that is steamed and takes about 10 minutes to make. Yes, only 10 minutes! And I’m going to teach you how to make jeera rice just like this. Its a really simple process, but I knew it needed to be written down. Because I have screwed this up many many times, and have been left with rice thats stuck to the bottom; undercooked or too mushy. But if you’ve ever eaten at an Indian restaurant or ordered jeera rice outside, you’ll know that its none of those things. And its the perfect side to dals and curries. I can literally eat this plain, because good quality basmati rice has so much flavour on its own. What do you need for Jeera Rice? Jeera rice only needs a few simple ingredients. Ghee or Butter, whole spices (bay leaf, cinnamon, cloves), jeera (or cumin seeds), green chillies, basmati rice and freshly chopped coriander. Thats all of six ingredients which you probably have in your pantry, so making this is actually easier than you thought! The perfect rice to water ratio for jeera rice is 1:2. Which means for every cup of rice, you need two cups of water. The rice is steamed in the liquid in a pan which is covered so that the steam does not escape. This rice to water ratio ensures that the rice is cooked just right – where every grain is fluffy and separate from each other. However, if you are cooking this in a pressure cooker, increase the rice to water ratio to 1:2.25. Because the number of ingredients in this recipe are so few, I recommend using really good quality basmati rice. I used Daawat’s extra long Basmati Rice which is aged for two years, and smells amazing! Are you seriously tempted? Did I manage to push you over the edge? Are you running to the grocery store to pick up some basmati rice? Pair this recipe with dal fry, chana masala, mughlai chicken and paneer butter masala. 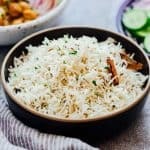 This recipe for jeera rice (Indian steamed cumin rice) will never fail you! You don’t need a rice cooker or fancy equipment to make this. 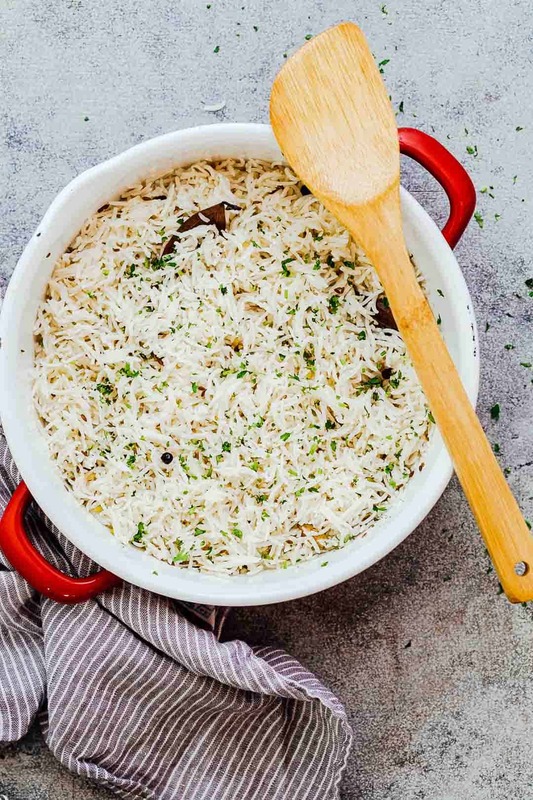 Just a few ingredients and a pot and you’ll have fluffy, flavourful jeera rice ready in under 10 minutes. 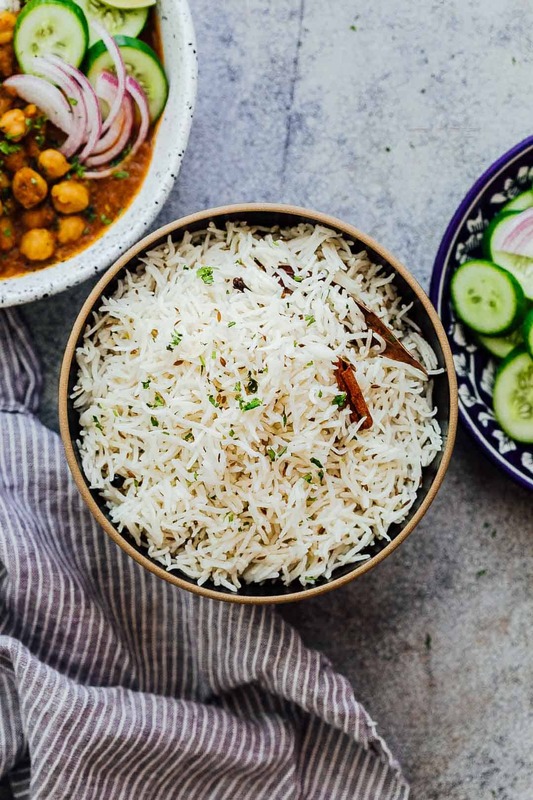 Wash the basmati rice a few times, and then soak it in enough water so that the rice is completely soaked and has an inch of extra water on top. Soak the rice for at least 30 minutes. When you are ready to cook, drain all the water from the rice and set the rice aside. Heat ghee in a pot and add the whole spices and cumin seeds to it. Once the cumin seeds start spluttering, add the chopped green chilli and drained rice to it. Saute the rice in the pan for two minutes on a medium flame. This helps add more flavour to the rice. Add two cups water and salt to the rice and mix well. Bring the rice to a quick boil, and then reduce the heat to a simmer. Cover and cook for approximately five to six minutes, till all the water has evaporated and the rice is cooked through. Top with chopped coriander and serve hot. Wonderful guide. I just made my first Jeera Rice by my own with this guidance and trust me it tastes awesome. A big Thank You. Do you have any app available in Google play store ? Thank you so much Swarnendu! And no, I don’t have an app available. I tried it. It was awesome. Thanks. So glad you liked it Suvarna! I remember eating this rice in my visits to India, but didn’t know what it was called. Now I can make it at home. Thanks for sharing the recipe and your technique. Unique recipe…I am successful in my first attempt…Thanks..